There are some flavors that a person really misses after moving to a low sugar diet. 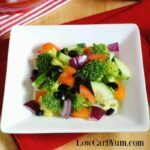 Thankfully, you can usually satisfy those tastes with low carb alternatives. I used to love snacking on a fresh banana. But, these days, I rarely take more than a bite or two of this high carb fruit these days. A couple of my recipes do use real bananas like my banana split cake and low carb banana bread. But, I split a single banana among many servings so the sugar in one serving is negligible. For this sugar free banana cream pie, I left the banana out. 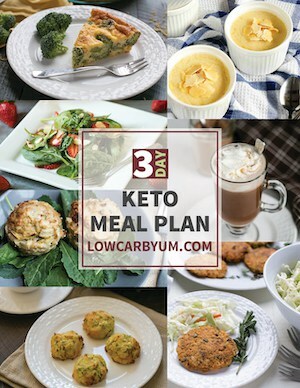 That keeps the carbs to a minimum so you can enjoy the dessert without worry. The filling for the pie is based on my low carb banana pudding recipe. That pudding isn’t firm enough for a pie filling so I had to up the thickener. In the original recipe, I used xanthan gum. However, there has been some concerns about emulsifiers such as xanthan gum. Although I’ve been looking at konjac powder as an alternative to xanthan gum, I haven’t had the time to experiment with it. You may be familiar with shirataki noodles which are made with konjac. Since I didn’t have the time to try konjac powder, I used grass-fed gelatin to thicken the filling in this sugar free banana cream pie. Gelatin has many benefits and I’m not aware of any harmful side effects. I also used gelatin to stabilize the whipped cream topping. Without it, the whipped heavy cream tends to go flat as it sits. 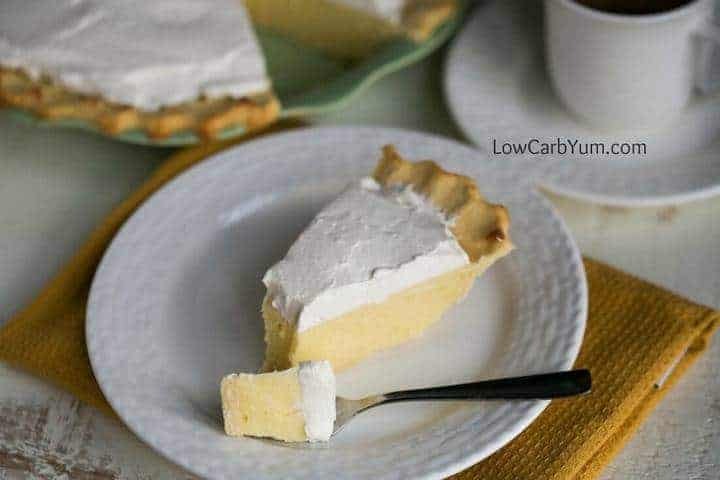 If you want to share the pie with those not following a low carb diet, you can always offer fresh banana slices as garnish. And, you can also dress it up with fresh whipped cream just before serving. As for the crust, I used my coconut flour pie crust recipe. 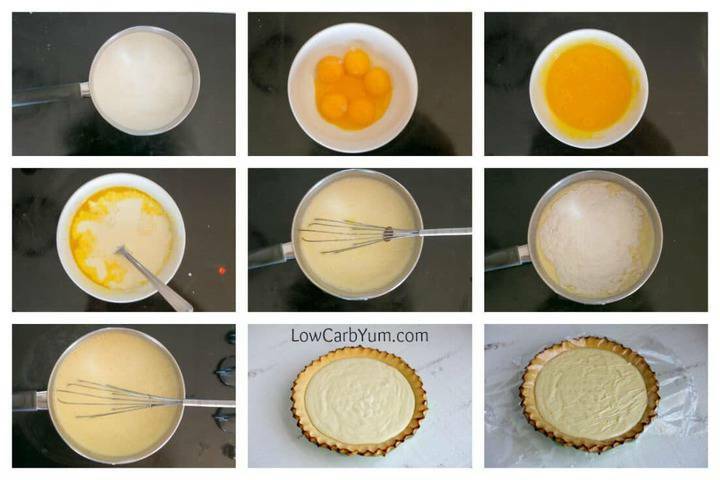 But, you can use any low carb pie crust. The one on my key lime pie recipe uses a mix of almond and coconut flour and it’s always been a family favorite. 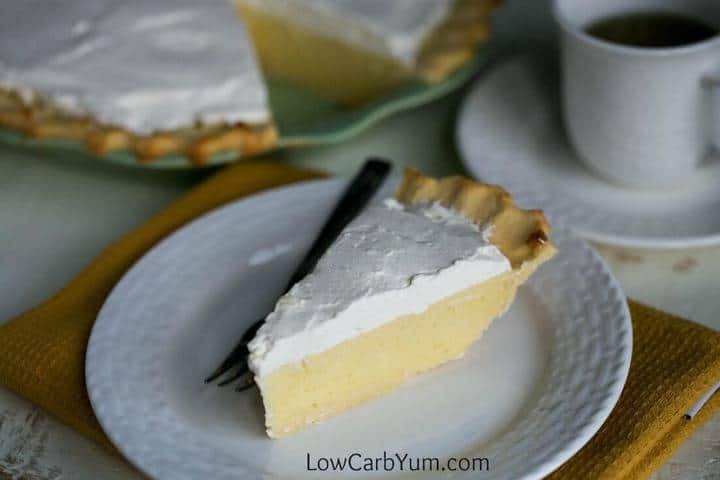 No matter how you slice it, this yummy sugar free banana cream pie is sure to be a hit. I’m planning to test it out with my extended family over the holidays. You may be wondering how the pie tastes without bananas. 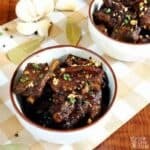 I used banana extract which gives all the flavor without the carbs. Extracts as well as flavored herbal teas are perfect for making very low carb treats and dessert. 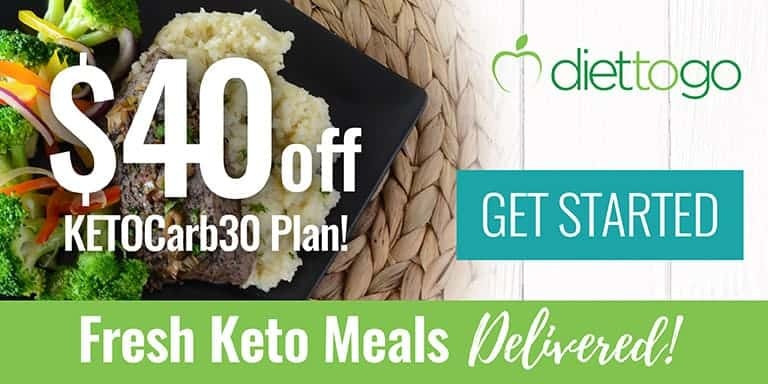 They give you the taste you want without excess calories or carbs. 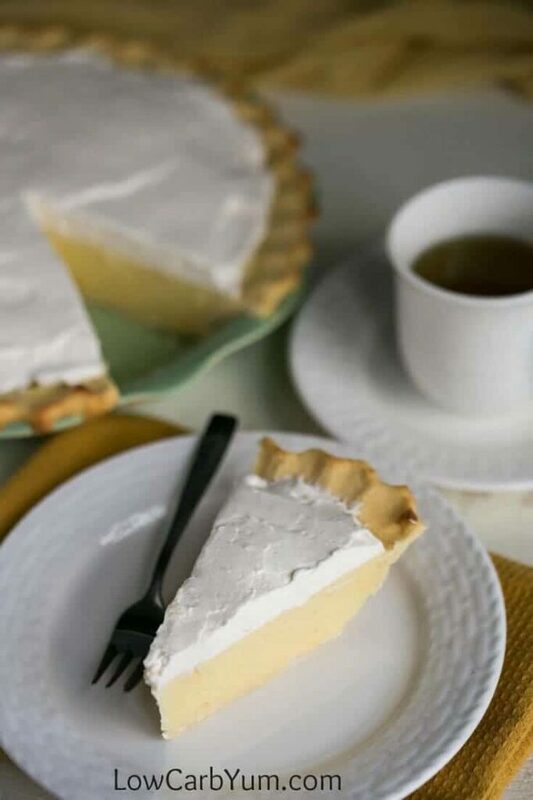 Although I’ve been cutting back on sweets, this pie is a nice treat to warm up to the holidays. 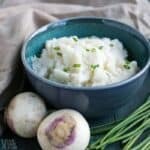 I haven’t decided what to cook for Thanksgiving, but you can bet it will be a nice low carb spread. 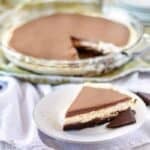 A low carb banana cream pie with a gluten free coconut flour pie crust. No need to worry because there are no bananas in the dessert! Sprinkle gelatin over cold water to soften for a minute. Stir hot water over softened gelatin and stir until dissolved. When cream is hot, slowly add about 1/2 cup to egg yolks, stirring constantly. Pour yolk mixture slowly into hot cream while whisking. Reduce heat to low, then mix in sweeteners. Stir in banana extract and dissolved gelatin. Cool slightly then pour into pie crust and cover with plastic wrap. Sprinkle gelatin onto cold water in small cup to soften. Once soft, stir in hot water until all gelatin is dissolved. Pour heavy cream, vanilla, and sweetener into large mixing bowl. Beat until stiff while slowly adding in dissolved gelatin. 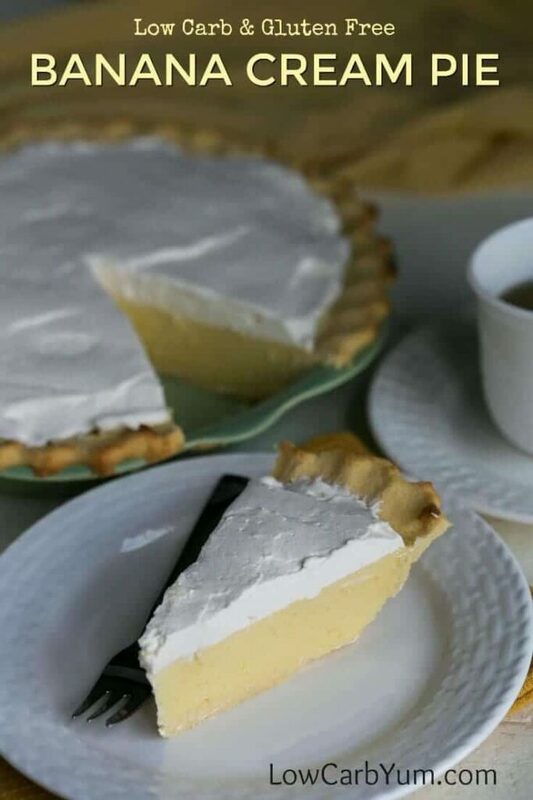 Remove plastic wrap from pie top and spread whipped cream over banana filling. 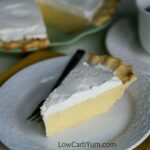 [post_content] => A low carb banana cream pie with a gluten free coconut flour pie crust. No need to worry because there are no bananas in the dessert!